Hey crafty friends! Sorry it's been so long since I posted, but that is because I have been working on cards for a bunch of upcoming events! So get ready, because my blog is going to be hopping starting today! (Literally, in some cases....lol!) It seems this is the year of the 4th birthday bash for many of the companies I work with...and today we are celebrating SugarPea Designs! 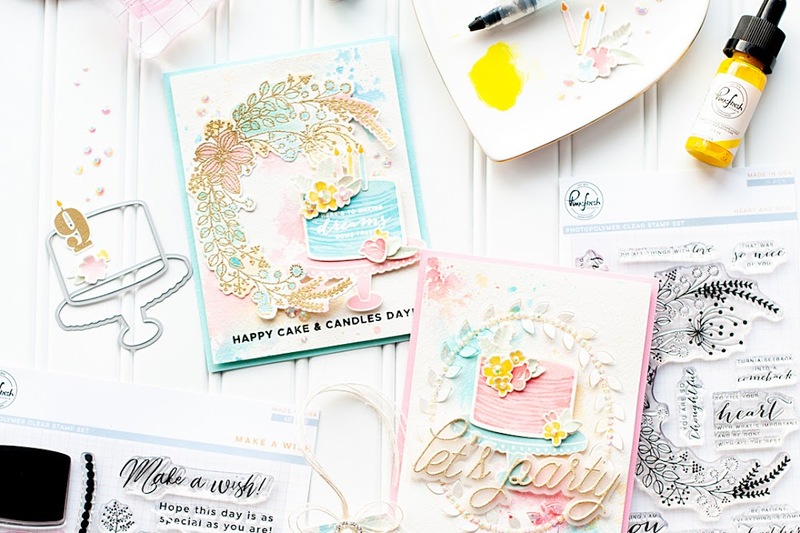 Today we have a HUGE blog hop line up with projects that are going to knock your birthday socks off using amazing SugarPea Designs products!! I will share all the pertinent information & blog hop link list at the end of my post, but how about we get to my card?! 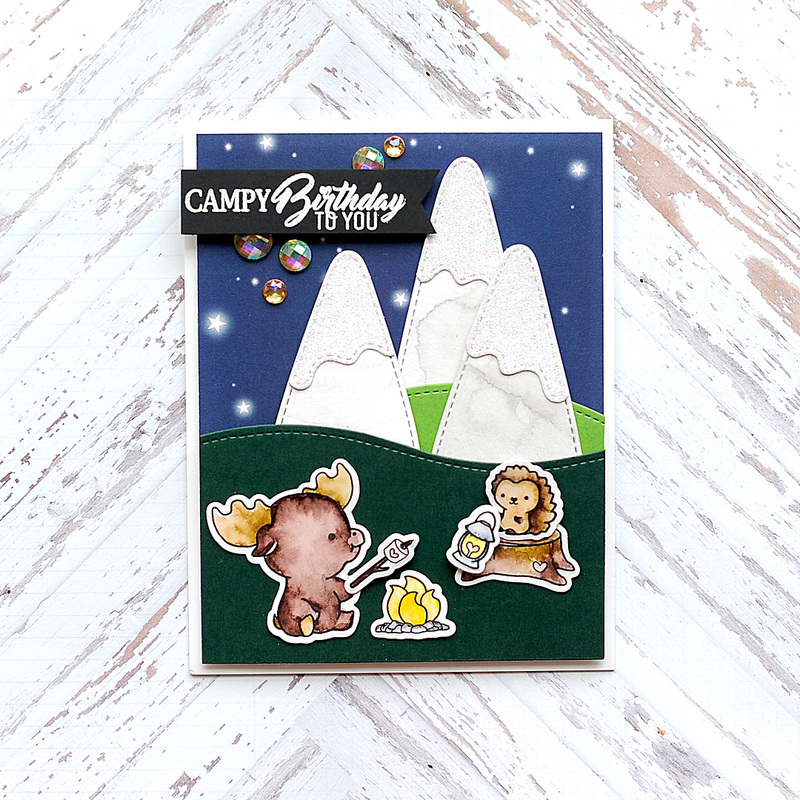 I am SO excited for the two weeks we have planned to spend in Montana this summer, and that inspired me to create this campy little birthday card! To start, I created an A2 card from white heavyweight cardstock. I cut the Happy Camper patterned paper slightly smaller, then adhered it to the card front with foam adhesive to give it added dimension! Next I watercolored some white cardstock with grey, then sped up drying process by using my heat gun. 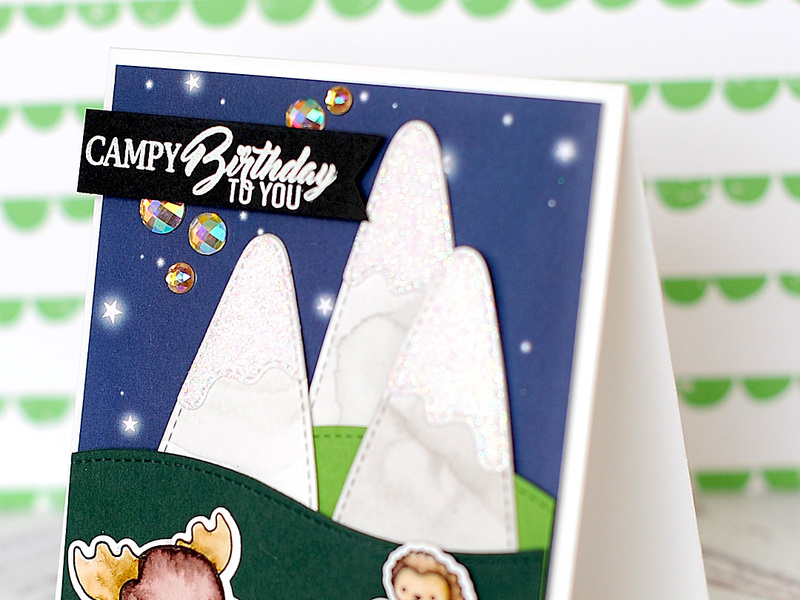 I diecut the mountains from the watercolor cardstock, the snow caps from white cardstock & covered those in glitter. Then I layered them together, & set aside. Next I diecut the hills from two shades of green cardstock using the Card Front Element Builder SugarCuts. I then layered the mountains & the hills to the card front, starting with the larger mountain & finishing with the dark green hill. Next I stamped the animals & elements from the Easily A'Moosed stamp set to white cardstock using onyx black Versafine ink. I hit it with some heat to make sure it was set, then watercolored all of the elements using Zig Clean Color Real Markers, and a size 2 watercolor brush. I added a little shimmer to the fire & the lantern using my Wink of Stella glitter pen. Then I diecut each element with the coordinating Easily A'Moosed SugarCuts, and created their little scene at the bottom of my card. That is my fun little birthday card for you...I hope that you love it! Okay - now let's get to all of the blog hop details! Are you ready for the mother of all blog hops?! Here is your link list!! My goodness...what a list! I can't wait to sit down with a cup of coffee & check out all of the amazing creations to be seen along the hop! I adore your sweet scenery design Lea! Love your card. Love how you put it together. Cute animals and love the jewels. Supercute card, love your choice of stamps for this hop! Such a cute little camping scene! I love all the details you put in. I really like the watercolor elements, especially the soft gray of the mountains, and had already noted how the iridescence of the jewels added to the night-time scene! Am I seeing things, or does the moose look like he's blowing on his marshmallow? It almost looks as if it's drawn that way! How fun is that. I might have to make s'mores for the grands today...hmmmmmm. Thanks for multiple cool ideas! Your critters are so cute! Thanks for sharing. I really love that effect you got with the gray watercolor on the mountains paired with glitter paper, I'll definitely have to give that a try! Thanks for the inspiration! 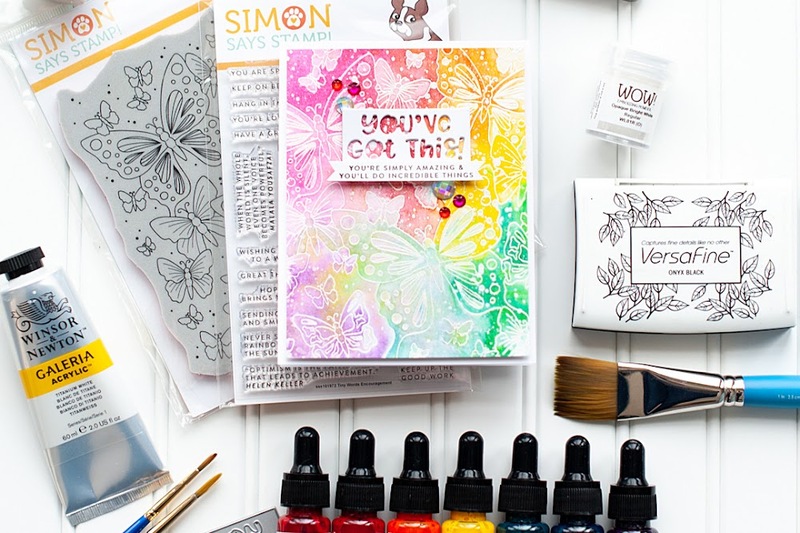 Love the way you have use the stamps and dies on your card! Oh my, what a clever scene...I especially like that sparkly, night sky! Camping cards always get me ----love it!! Your little animals are just precious. What an awesome scene card this is! Gorgeous in every delightful way. I love all the different layers on this card. Makes me very happy. I like the sweet scene you've created with these cute critters! Cute camping scene. Love the mountains in the back. Thank you for sharing the cuteness! So cute. Love the fun scene and darling images. What an adorable card. Love the vibrant colors. Your card is so cute! I love these blog hops. Dies and stamps I would not have given a second look I really like. These will now be on my wishlist. Thank you for sharing. 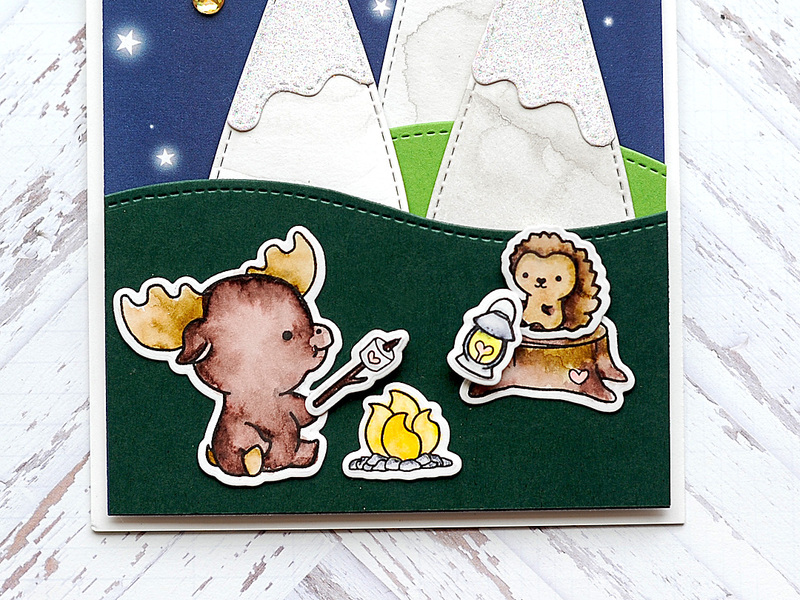 I love camping cards and this one is super cute!! Really awesome design! Thank you for sharing! Nice job! I love camping cards. Cute and punny card. Just adorable! Your card is super cute and adorable! Such a sweet scene and fun sentiment! Adorable card. Makes me want to roast marshmallows. Adorable card! Love the scene you created, and those sequins are fabulous! 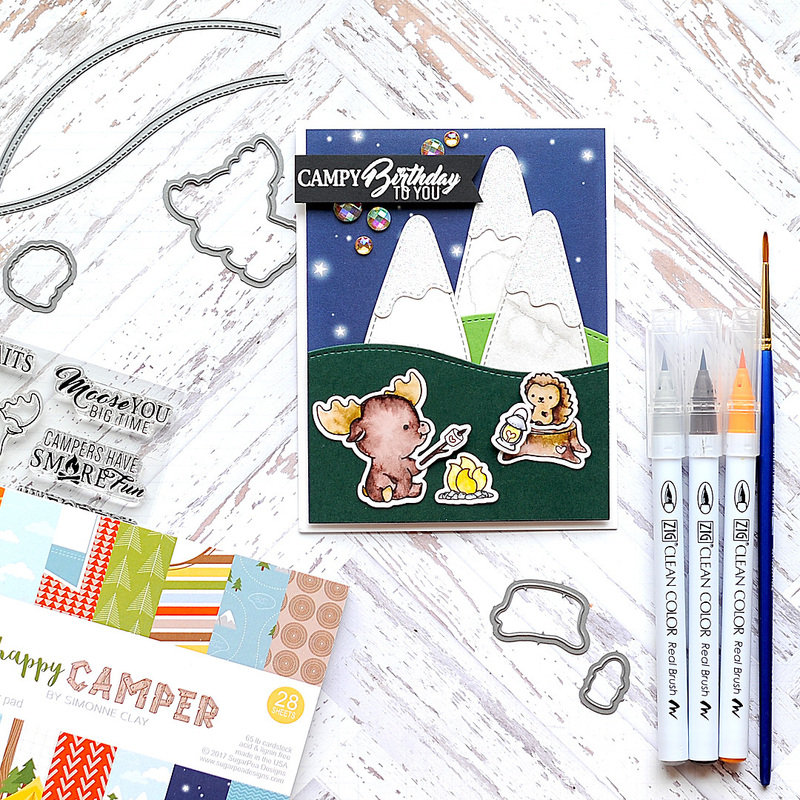 Your campy card is super adorable! Love it!! So cute - love the moose toasting the marshmallow. How cute, great idea and beautiful…. What a cute card, Lea! That camping scene couldn't be any darn cuter!! 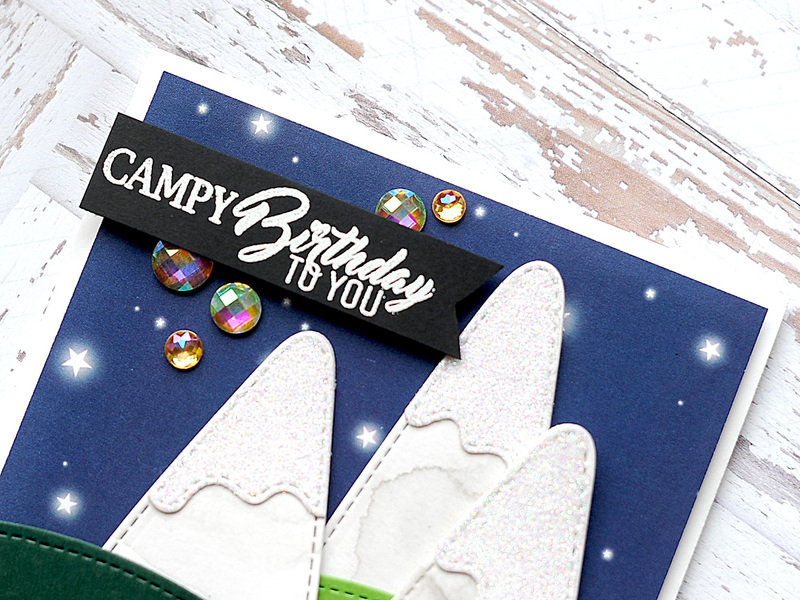 I've never made a "camping" card and your card makes me want to give it a try! So cute! Love this fun scene you created! 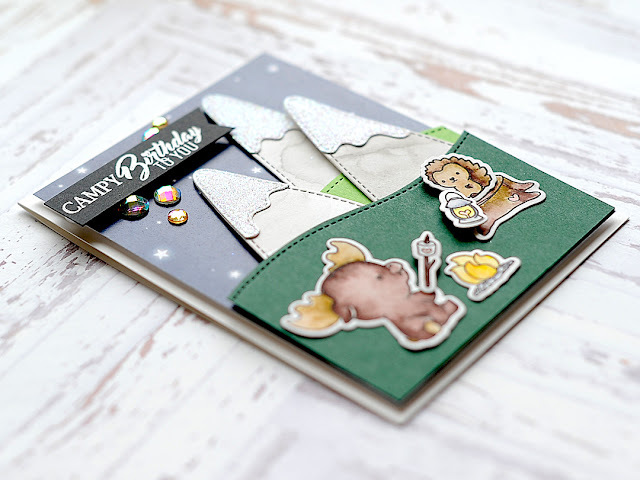 Happy 4th birthday to SugarPea Designs! This card is adorable! I love everything about it!! Those campers are really cute! So cute! Wonderful composition and rich colors so nicely compliment those sweet campers. What a cute scene. I love the coloring. Love the scene you have created. So cute! I'm love the card it has mountains which I adore and you made everything for the camp how cute. Great!!!!!!!!!!!!!! What a great scene! I'm lovin' the card front element builder- thanks for sharing and inspiring! So adorable! Love those mountains... love how tall they are! And you've put a gorgeous scene together... love it! Great card for a NW card maker! Oh my goodness this card is adorable. Those little critters are so darn cute. Thanks for sharing! You created such a cute little scene, thanks so much for sharing! Really adorable character. Such a cute card. Such adorable faces! Love your card. Awww!!! This card is totally cute!!! What cute camping friends...great night scene. Such a cute scene! Love your jewel stars. WOW, really cute little critters on this fun card, like the setting for them. Great scene you created! Love the mountains and sparkly sky with sequins! Love how you used a different color palette than the usual. A unique and interesting card! Thanks for sharing! Very cute card. Love your sparkling stars. My favorite part is that campfire. Super cute! Lovin' the scene you created! Oh camping! Too much fun! That’s a very sweet birthday card ! Your little moose with the marshmallow is super cute! Love it! This is so adorable!!! 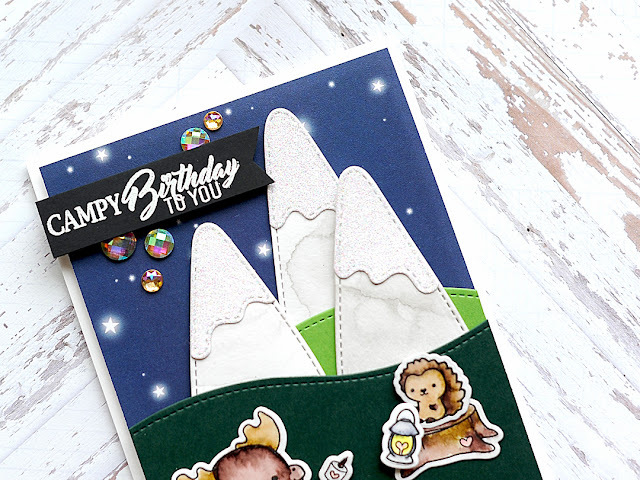 I love your snow-capped mountains and those rhinestones definitely look like shooting stars! Adorable little campy scene, Lea! Oh my word Lea, where to start on this adorable card? The sweet critters? The awesome mountains with their glittery caps? That gorgeous bling? EEEEK! I love it all! 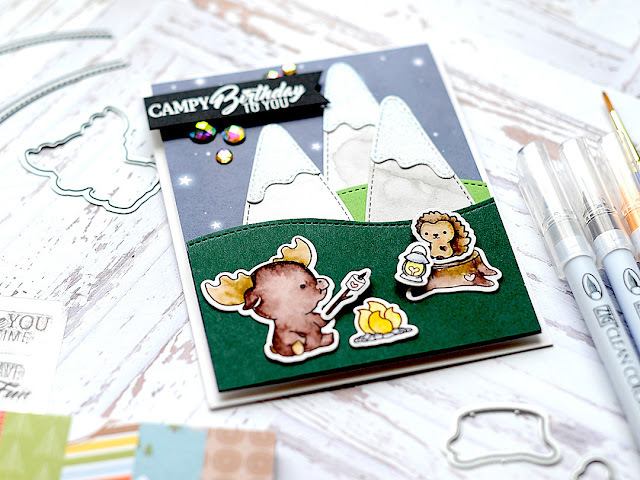 Love your little mountain scene, super cute critters and mountains! Such a cute stamp set! 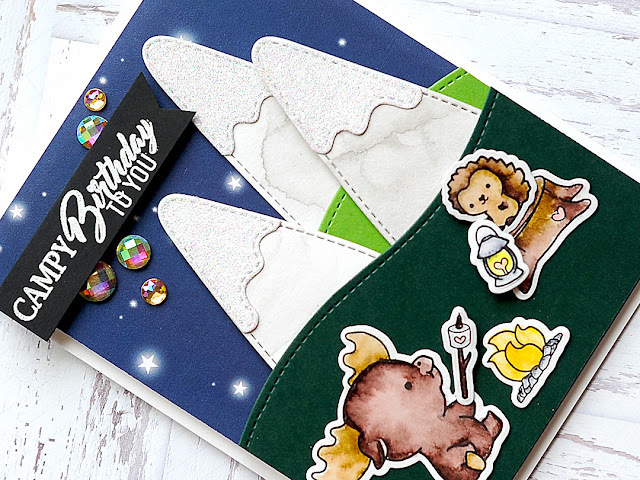 Adorable little scene you created and the jewels are perfect in the night sky! What a fun scene you created! Darling! Such a cute camp scene! 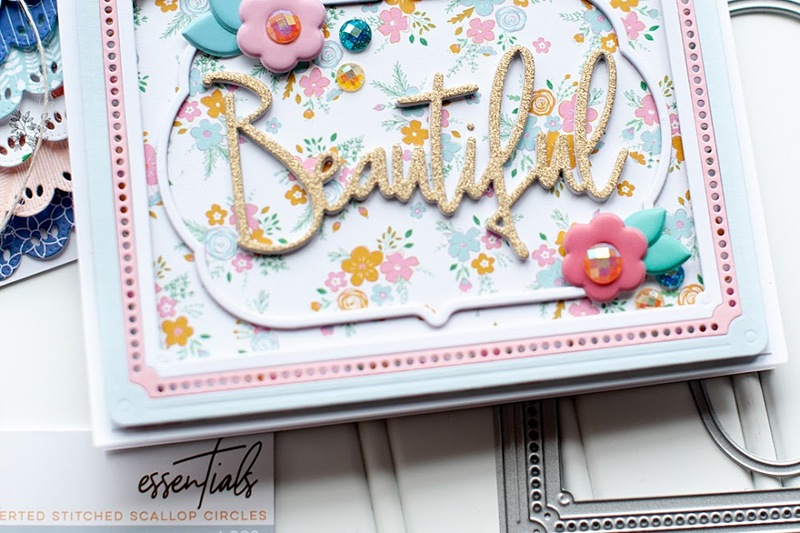 I had never seen this stamp set (I'm kind of new to SugarPea), and now I'm totally in love. I like the deep forest-y/nightttime colors you used as well. Thanks for sharing with us! Such a cute card! Love the background and the added gemstones! What a super fun scene and I love how you did the night sky!! Congrats to SugarPea on their 4th anniversary!